MINNEAPOLIS (AP) — The Minnesota police officer who pulled over Philando Castile politely told the driver that his brake lights were out and calmly instructed him not to pull out his handgun before suddenly drawing his own weapon and firing seven rounds into the car, a video released Tuesday showed. “Sir, I have to tell you, I do have a firearm on me,” Castile said. “I feel like it’s 10 times worse now,” said Sibet, who is white. “If the officer would’ve exercised more caution, it may not have escalated as fast,” he said. “He already thought in his mind that this was a suspect in a robbery, and he just panicked and he messed up,” said Lenoir, who is mixed race, African-American and white. 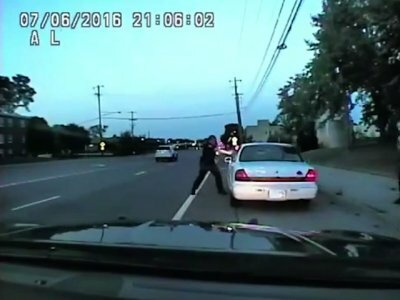 The footage shows a wide view of the traffic stop and the shooting, with the camera pointed toward Castile’s vehicle. It captures what was said between the two men. The video does not show what happened inside the car or what Yanez saw. The video shows Yanez following Castile’s car, then pulling it over. Yanez can be seen approaching Castile and asking for a driver’s license and proof of insurance. Castile gives the proof of insurance to Yanez through the driver’s side window, and the officer puts it in his pocket. After the first shot, Castile’s body is thrown to the right. The video shows Yanez’s backup officer, Joseph Kauser, standing on the passenger side of the vehicle, retreating when the shots were fired. When the shooting stops, the video shows Yanez standing at the car window with his gun drawn for some time. Reynolds’ then-4-year-old daughter starts to get out of the car and is grabbed by an officer. Yanez’s acquittal prompted days of protests, including one in St. Paul last Friday that attracted thousands and shut down Interstate 94 for hours. Eighteen people were arrested.